(Re) 4x4 sprinter...4WD...aftermarket options.... Lockers are available if desired. Really!? I have not heard of aftermarket lockers being available on Sprinters. Can anyone else confirm this? Sources?? As far as I know there are no lockers available for the factory rear axle in the united states. The Lockers I was referring to were on the retrofitted axles used on 4 x 4 conversions. I do know that there are several limited slip or TBD differentials available in Europe for the sprinter rear axle. I would, in general weather Sprinter/Ford/Chevy, strongly suggest to ONLY look for a solution that can make a supply chain sure for several years! There are often companys offering something and after 5 years they close their Business. You can never again by any Kind of Parts. I heard good and bad stories about achtleitner, oberaigner and co. If you are in the middle of nowhere, which means not in the us probably, and you need parts, you know what i mean. Having a E350 in Europe, is Kind of similar ;-), and even more in Afrika. BUT with fast global trading you can order s parts at Summit e.g. with 7 days Transport with no issues. A small company with no parts stock, can cause a lot of trouble! Btw that's why I cannot order shocks/Coils from agile. And not just me but also 3 other E350 4x4 drivers in Germany, who tried get parts. I think Sprinters sold overseas with differential locks cannot be bought/sold in US as per DOT regulations. A foreigner can bring one in for his own use for 1 year maximum. I received a message from Whitefeather that they can take a 2WD Sprinter, give it a lift, convert to true 4WD, and add a front differential lock. The existing traction control on the rear is welded on and cannot be altered. Would it not be sufficient/easier/cheaper to retrofit a 2WD with a rear diff-lock and a modest lift - that could take you a long way - maybe also bring a few maxtrax. I have a high roof 1986 VW LT35 with a factory rear diff-lock (ex military ambulance) and apart from the stock ground clearance it does quite well off tarmac. I'm doing my due diligence online researching the wisdom (price independent) of taking my soon to be 2017 MB Sprinter 2.1L RWD to Whitefeather Conversions in Red Bluff, CA. Greg sounds very knowledgeable but, I'm anxious about parts/service availability, adding 500 lbs. to a 4 liter turbo-diesel's payload, and especially his conversion's compatibility with MB's complex electronic traction control systems. Does anyone had or know someone who's had a Whitefeather (Sprinter) conversion? I've done the online research; I'm looking for more word of mouth intel. Why not go with the factory 4x4? They seem to be at a good price point vs a conversion. I'd be very wary of altering the Traction and Stability control on an MB. 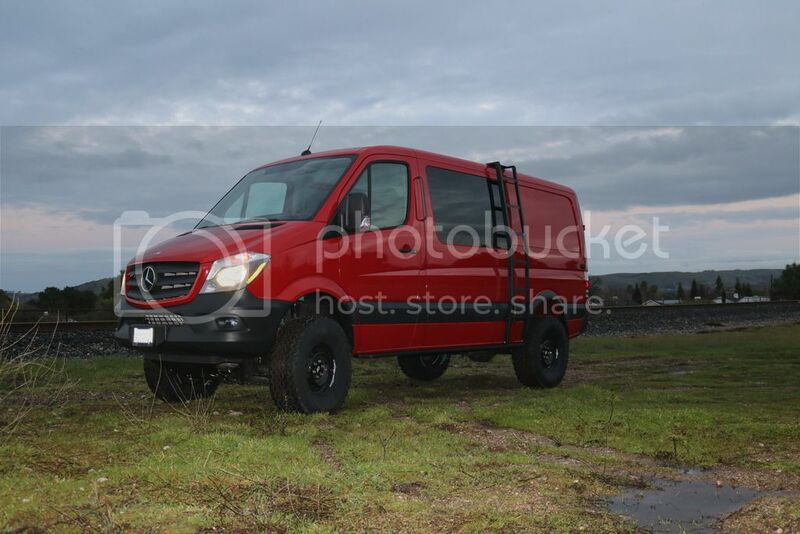 I priced up a Sprinter 4x4 with low range on their website and I was pleasantly surprised. I added a lot of options too. There has been reports of White Feather not being able to come up with a way to address the ABS and traction control issues - which would make it pretty undesirable for off-road use IMHO. Be careful and get anything they say in writing in case the deal goes south. Unfortunate you can't get the 4 cylinder engine with the factory 4x4 option - is that why you are looking at other options? How big of a van are you going with? For kicks I priced up a brand new MB shorty low roof loaded down with 4x4 and Low Range. I was pleasantly surprised. They really aren't too bad considering the purchase price of pretty much any new 4x4. I absolutely love driving this thing everyday. That's not stock is it?? If not what kind of mods do you have on it?? That's a really nice looking ride! Suspension; Van Compass 4x4 2" lift kit, 315/75/16 General Grabber AT2, Agile Offroad wheel spacers. Armor; Van Compass skids, rockers and ladder. Awesome!! And you got a 34.5" tire in there?? Sorry. Too many questions. But that's a really nice ride!! If I was going brand new I would for sure take a hard look at the Sprinter with an SMB top on it. Lift kit with bigger tires?? YES! !